If you’re looking for the best pregnancy pillows, you probably already have an ache or pain that you’re trying to relieve. Maternity is hard work, especially the part where you carry an extra person around, and so you need all the sleep you can get. The difficulty that comes from sleeping with a baby-bump or trying to transition to a new sleep position can keep you from getting the rest you need. If you choose the right pregnancy pillow and learn how to use it properly, it could make all the difference in your comfort and restfulness. Read below to learn everything you need to know about how to improve your sleep and make your maternity a breeze. Get ready to make an informed choice on the best pregnancy pillow for your sleeping needs. How Does a Pregnancy Pillow work? When Do You Need a Pregnancy Pillow? Once you get to your second trimester, it’s usually understood that you need to begin sleeping on your side. Sleeping on your stomach is—obviously—not going to work out, and if you sleep on your back, the added weight of your belly can put pressure on your spine that will cause you more pain in the long run. But a lot of women don’t usually sleep on their sides, and this transition can be unpleasant. Using a pregnancy pillow can help with this immensely because they’re designed to make these types of positions more comfortable, even if you’re not used to them. Most experts advise pregnant women to sleep on their left side, for a few reasons: sleeping on your left keeps the weight of your baby bump off of the liver, which lies directly beside your uterus to the left, and also allows for the best blood circulation during sleep. Moreover, it keeps the stomach juices from flowing up the esophagus. Added support: Added support is perhaps the most significant added benefit of using a pregnancy pillow. You suddenly have all this extra weight, and asking your body to carry it all is just not fair, not to mention not smart. Pregnancy pillows are designed to be wedged into those places that suddenly need to support much more than their average weight, such as under your baby bump if you sleep on your side, or beneath your lower back. Increased stability: If you’re one of those people who usually move around a lot in their sleep, a pregnancy pillow can provide increased stability to your sleep position throughout the night. Because most pregnancy pillows are designed to cradle or support you in some way, your body will likely not want to move away from a comfortable position during sleep, and instead will stay in the position that you chose for whatever reason. Sleep position trainer: As mentioned briefly before, if you’re trying to train yourself to sleep in a position that is typically unusual for you—likely on your side—a body pillow can be an excellent tool. As your body conforms to the unique shape of the pillow, muscle memory will lock that position in as one that provides comfort and support, which will make sleeping in those positions easier, even without the pregnancy pillow. The science behind pregnancy pillows comes from the need to support the painful areas unique to women during maternity whose bodies are changing and adapting to carry a child. It comes with some problem spots and aches to heal, and a good pregnancy pillow will be able to comfort them all. Some people think that pregnancy pillows can be substituted for regular or memory foam pillows. But head pillows are designed specifically to support the head and neck, just as pregnancy pillows are designed to support the pregnant woman’s body. It usually means that they’re longer, working to support the whole length of the body. A pregnancy body pillow will then be able to support the head, neck, belly, hips, and knees. They are also curved and shaped to perform particular functions—U-shape body pillows are engineered specifically to wrap around and support the entire body, front and back, while smaller wedge pillows are shaped to provide the correct slope for supporting a baby bump or acing lower back. You can begin using a pregnancy pillow at any time during your maternity period. It’s never really too early—if it makes you more comfortable, you should use one. 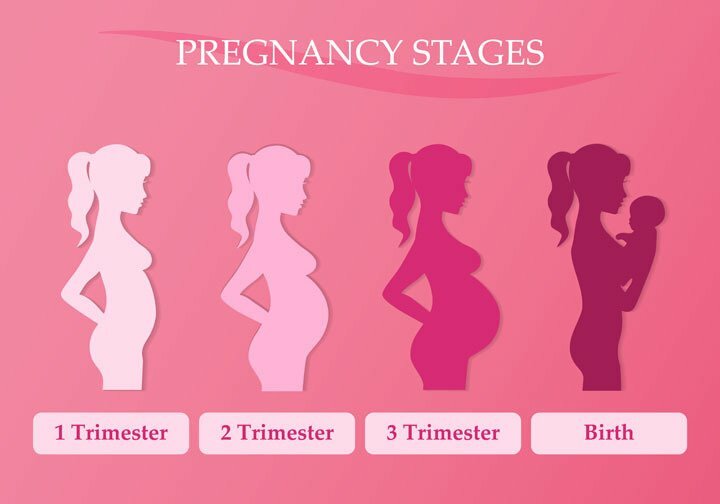 Most women find that they begin to need to use a pregnancy pillow in the second trimester when the baby undergoes a lot of physical growth and the weight and shape of your baby bump begin to show. At this point, the physical need for added support becomes obvious. But there are also other times when you can use a pregnancy pillow—even when you’re not technically carrying the child with you anymore. You might find that certain pillows are necessary for providing support in certain areas, both during and after delivery. Pregnancy pillows, particularly full body pillows, can make it easier if you decide you want the baby to sleep in the bed with you. U-shape pillows can do a lovely job of cradling the baby next to your body, and providing a stable place that won’t allow for must shifting or rolling around during sleep. In the same way, it’s common for breastfeeding women to use their pregnancy pillows for support when breastfeeding, laying the pillow across their laps and using it either to rest the baby on or to support their arms as they hold the baby. It might even be possible that you use a pregnancy pillow after you’re no longer pregnant just because you’ve become used to it. There’s nothing wrong with this. Once again, the point is to make you more comfortable, and if the pregnancy pillow is letting you sleep a little easier, then use it. You’ll need all the sleep you can get, especially with a newborn in the house. Depending on which type of pregnancy pillow you choose, you will be able to position it in different ways or use it in conjunction with other pillows to find your most comfortable position. If you choose a larger pregnancy pillow, you will likely use it alone. Most larger pillows are the full length of your body, which means they will also provide the necessary support for your head and neck, and will probably replace your regular pillows. There are specialty pillows—such as a wedge pillow—which is designed to specifically support a particular area in your body, such as your belly bump or lower back, but even without the additional support of specialty pillows, the best pregnancy pillows will likely provide support from your head to your hips. However, some women experience discomfort between their knees during pregnancy. Using another pillow, such as a good knee pillow, will provide that extra support and make for a more centered body during sleep. Whichever pregnancy pillow you choose, make sure that it is positioned beneath the areas that will carry the most stress while you sleep, so that your body stays linear and you won’t experience discomfort when you have to stand up the next day. Your best indication of whether or not you’re positioning your pregnancy pillow correctly will be your comfort. If it fits and feels good—especially the next day—you’re probably doing it right for your own body. Don’t be afraid to switch it around and find out what works best for you. Wedge Pillow: Wedge pillows are the smallest and most common type of body pillow. It may be the right pillow for you if you’re only experiencing a little pain and want to support one area in particular. For example, you could place a wedge pillow below your lower spine to provide that bit of extra support if you still want to be able to sleep on your back. Full Body Pillows: Full body pregnancy pillows are the full length of your body. They’re designed to provide the same feeling of support and stability that you get from cuddling up to your partner, but without the pain and discomfort, you inevitably get from trying to rest that baby bump on another person’s hard body. C-Shape PIllows: C-shape body pillows are like the full body pillows but curved just a little to accommodate your unique body shape. Because of the way that they cradle you and your pregnancy bump, they can make a nice transition pillow for those trying to learn to sleep on their side. U-Shape Pillows: Another curved body pillow, the U-shape can be used between the legs so that it hugs both the front and the back while providing added hip support. It’s unique shape also allows you to use it as a wedge pillow, propping you up in specific problem areas. Inflatable Pillows: Inflatable pillows are specifically designed for women who usually sleep on their stomach. It looks a lot like an inflatable pool raft, but with a specially designed space for you, baby bumps to fit, so that you can stay in your most comfortable sleep position without harming your belly or its precious cargo. Here are the things to keep in mind when deciding which pregnancy pillow will work best for you. Your regular sleep position. Knowing whether you like to sleep on your side, your back or your stomach significantly influence your decision on which pregnancy pillow to buy. There are pillows designed to help women during pregnancy who are used to each particular position, giving support and structure to encourage a healthy, stable sleep style. Your pregnancy body changes. Everybody experiences the physical changes that come with pregnancy a little differently. What is it that you’re feeling the most? Is it the pull on your lower back from carrying around the extra weight? Or abdominal pain from strange, new pressure? Maybe your hips hurt from widening, or it’s just plain sleep deprivation. Firmness. Know whether or not you have an affinity for a particular firmness in a pillow. Likely, you already have some idea based on what you choose for your head and neck pillows. But the pregnancy pillows supporting your baby bump and back may be a little different, so don’t be afraid to try out a few levels of firmness before you make your decision. Versatility. Unless you need a specific type of body pillow, it might be worth considering the versatility of each type. Will you be able to use it again, when breastfeeding. For example, some types of pregnancy pillows are simply too large and unwieldy to use outside of sleeping? Consider whether you’re willing to buy another pillow for these other purposes, or if you can get a pillow that will do it all. Amount of extra weight. Twins? If you’re carrying around two or more babies in there, your consideration of pregnancy pillows should account for this. You will likely want firmer, more specialized pregnancy pillows since the stress on your body and its effect on your comfort level will be even more severe. Your partner. Ah, yes. Your partner. We should probably think about him, too. A pregnancy pillow tends to be large or bulky, especially if you have a small bed. You want to make sure that your pregnancy pillow doesn’t take up all the space or affect your partner’s sleeping habits too much. You’ll want them to be well-rested, especially after the baby comes. Budget. Of course, any purchase should be weighed against your budget, especially during pregnancy when there are so many purchases to be made for the baby! If you have a relatively sizable budget allotted for pregnancy, or if you’ve weighed your priorities over this period, it’s no big deal to splurge a bit for a pregnancy pillow that makes sure you maximize your good night’s sleep, and that is irreplaceable. The Leachco pregnancy body pillow is an excellent starter for the pregnant women looking for a bit more support, and that’s why it’s included in this list. Its shape was designed by a registered nurse and mother to fit a pregnant woman’s unique curves best. This pillow is so versatile that you can even use it while you are watching your favorite movie or taking a quick nap during the daytime. It will offer the right amount of support to you and your baby. This pillow is one of the firmer C-shape pillows that isn’t memory foam, which allows for a good balance of support and comfort. Most importantly, you will be able to enjoy this maternity pillow without having any extra body heat. It’s crucial to stay clean when you are pregnant. So, make sure you spot-clean your maternity pillow regularly. If your Leachco Snoogle pregnancy pillow becomes flat or starts to clump, you can easily fluff it up as you would do with any other pillow. Long and easily positioned for maximum comfort. Offers the right level of support. Comes with a removable, washable 100% cotton cover. It does not lose its shape easily. Can be used as a support pillow while breastfeeding. Initially comes with a sturdy, tight seam on the neck area, which some say loosens on repeated use. Some found the pillow cover is not durable enough. Some people complained that it’s too high in the head section. Today's Mom Cozy Comfort Pregnancy Pillow offers excellent head and neck support so you will be able to replace your regular pillow. Also, it promotes extra shoulder support, which makes this maternity pillow unique from its counterparts available in the market. The curve of the pillow promotes a specific sleep style for healthy sleep during pregnancy, and the fill is soft and comfortable without being flimsy. It keeps mom's back protected and keeps baby cushioned while sleeping. There are lots of maternity pillows in the market, which feature a wobbly, weirdly shaped space for the head. But this one has a huge square head-rest area, which is perhaps the best feature of this pillow. Its head support works like a standard pillow to offer maximum comfort while sleeping. This product is a good option for those who want to be wrapped entirely in their pregnancy pillow, and need to receive support all over to keep the body aligned. This pillow helps to cradle the full body and keeps it in continual comfort. You can count on this fantastic pregnancy pillow, which comes with a removable zipper-cover. Moreover, the cover is removable and can be machine-washed. It doesn’t take too much space. Comes with an extra cover that’s easily removable and washable. The cover material may not allow for the best ventilation. Some people found the fabric itchy. This one is a long, loop-shaped pregnancy pillow. Stuffed with premium down, this is ideal for pregnant women who don’t need a lot of physical support and are looking for more comfort. It is one of the longer body pillows available and will provide support from your head all the way down to your ankles. It has enough room, which will allow you to stretch out your body. You will be able to re-position any side you like for watching a movie, and reading or working in bed. You don’t even have to worry about it losing its shape because this body pillow has an excellent reputation for holding its shape for an extended amount of time. It’s not going to get flat over time. Moonlight Slumber body pillow is made of Fusion Fiber. Fusion Fiber is made with polyester polymer, and that makes this it highly heat resistant. It offers full body support. Especially good for neck, back and knee support. The cover is 100% breathable cotton. It doesn’t lose its shape. The size can be a bit of a challenge to fit or to climb over for some. Some claimed the pillow is under-filled. It is an extremely versatile C-shape body pregnancy pillow that provides support from your head down to your knees. It wraps from the front of the body between the legs, cradling you from both sides. PharMeDoc full body pillow supports your head, neck, legs, back, knees and hips. This full body pillow is an ultimate necessity for any pregnant women who are having trouble of lacking right support when sleeping on their side. The poly-material fill of this pillow makes it more flexible than other pillows. You can readjust or twist this pillow into almost any shape you can imagine, making it good support for sleeping on your back or side sleeping. You can also easily adjust it into a great support pillow for sitting, which will come in handy even after the baby is born. When you are carrying your precious baby inside you, your health must be your top priority. It’s really important to stay clean at this stage. PharMeDoc maternity pillow will make your life easier as it comes with a zipper removable pillow cover, which is hypoallergenic, machine-washable, contains latex/zero phthalates/lead and most importantly BPA-free. The polyester hollow fiber is very firm without being stiff. Highly configurable to your desired position. Comes with a zip up cover. It does not come with a removable replacement cover. The polyester fill is on the firm side, for those who prefer their pillows softer. If you’re looking for another pregnancy pillow for specific areas of your body, Hiccapop Pregnancy Pillow works perfectly well. This memory foam wedge is perfect for firm support beneath your baby bump, your lower back, or your knees. You need to place it under your belly, between your knees or behind your back, which will help you feel more comfortable while you sleep. This wonderful pillow also helps to relieve leg numbness and nerve pain. Its small size makes it versatile and easy to travel with. Angle it for perfect comfort wherever you need to support the most. The firmness of the high-quality memory foam provides more support than traditional wedge pillows, and can even keep you from rolling over in your sleep if positioned correctly. Hiccapop Pregnancy Pillow Wedge has 2-sided design, which will work throughout all three trimesters. Soft memory foam on side 1, firmer support foam on side 2 and Deluxe. You can easily change it whenever you want; you just need to flip it over to regain ultimate comfort. The top feature of this pillow, however, is the plush velboa fabric. It makes the pillow incredibly soft and comfortable, without making you too hot while you sleep. You can also remove it for easy washing. This maternity pillow is very travel-friendly as it comes with its carry bag. You can easily carry it from your bedroom to your cozy couch for a quick nap. You can easily tuck the pillow wedge wherever you want. The cover is made out of soft, hypoallergenic material which makes the pillow very comfortable to use. It has two different sides of firmness. It doesn't take up too much space. Will not give you full body support, but its memory foam will provide good support to the area you tuck the wedge in. Some claimed it doesn't stay in place well. Finding the best pregnancy pillow for you isn’t a daunting task when you keep in mind your priorities and your preferences. Keep in mind your specific needs for support and comfort at this time, as well as versatility, and many other such considerations as well. May it be a full body pillow to hug you through the night, or a wedge that keeps your belly safe and sound, there's a pregnancy pillow for you that will make both mommy and the baby happy! Good luck, and sweet dreams!